A sign was unveiled last week designating the intersection of North Broadway and Lincoln Park Avenue in Lincoln Heights as Kenny Washington Square in honor of the late pioneering running back. UCLA football coach Jim Mora and athletic director Dan Guerrero were among the speakers at a ceremony at Washington’s alma mater, Lincoln High School, in connection with the unveiling of the sign near the school. “Kenny Washington’s signing opened the doors for future African American players to follow in his footsteps and started the Rams down a path to recognizing the importance of diversity,” Demoff wrote. Washington helped lead Lincoln High School to the 1935 Los Angeles City Section football and baseball championships and became UCLA’s first All-American football player in 1939. Washington was initially barred from the NFL because he was black, playing instead for the Hollywood Bears of the Pacific Coast Professional Football League from 1940-45. When the Cleveland Rams moved to Los Angeles in 1946, the Los Angeles Memorial Coliseum Commission made integrating the team a condition of it being allowed to play in the stadium. Washington signed with the Rams on March 9, 1946, becoming the first black player in the NFL since 1933. He played with the Rams through 1948. Following his playing career, Washington was a Los Angeles Police Department officer, actor, held various civic leadership positions and was a scout for the Los Angeles Dodgers. He died in 1971 at the age of 52. 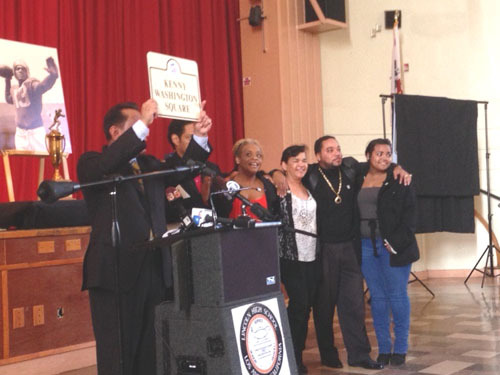 The Los Angeles City Council voted 12-0, with three members absent, on Jan. 14 to approve a motion by Councilman Gilbert Cedillo to name the intersection in honor of Washington. The effort to have the intersection named for Washington was spearheaded by the Kenny Washington Stadium Foundation, which seeks to recognize and preserve Washington’s legacy and modernize the athletic field and stadium at Lincoln High School.